The 542 companies listed on this website are my personal picks for the best you can find in your town. Yes, I have spoken with ALL of them, and I do believe you are better off hiring a company listed on my directory than by doing your own search in your area. Nuisance wildlife control and wild animal management is a specialty line of work, unlike traditional pest control, which typically implies insect control. 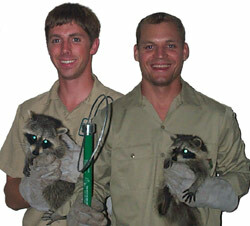 Nuisance animal trappers deal strictly with mammals and reptiles. There's a big difference between simply spraying a lawn with poison to kill the ants and actually solving a problem with a large animal, such as a raccoon in an attic. Human-wildlife conflicts continue to grow as human populations grow and we spread out development into previously untouched wildlife habitat. Many wildlife species have gone into decline, but some have learned to adapt and even thrive in developed areas. Some animals simply survive better in urban habitats, such as rats and pigeons. Raccoons have learned that garbage cans, dumpsters, and pet dishes make easy sources of food. Squirrels know that buildings are better to live in than trees. When wild animals live in buildings they can destroy property (chewing on wires, etc), make noise (which keeps people awake at night) and cause biohazard and health risks from waste.